People are finally realizing what Ayurvedic practitioners in India have known for thousands of years: turmeric is a powerful anti-inflammatory that can potentially help combat inflammatory disorders, such as rheumatoid arthritis and osteoarthritis, slow the rate of cancer growth, and improve cognitive function. More recently, researchers have even been examining the potential for turmeric to enhance weight loss and decrease insulin resistance. It is also important to know what most people don’t: turmeric is poorly absorbed in the body and has minimal impact on blood levels when taken alone. One way of enhancing turmeric / curcumin absorption is through fermentation. 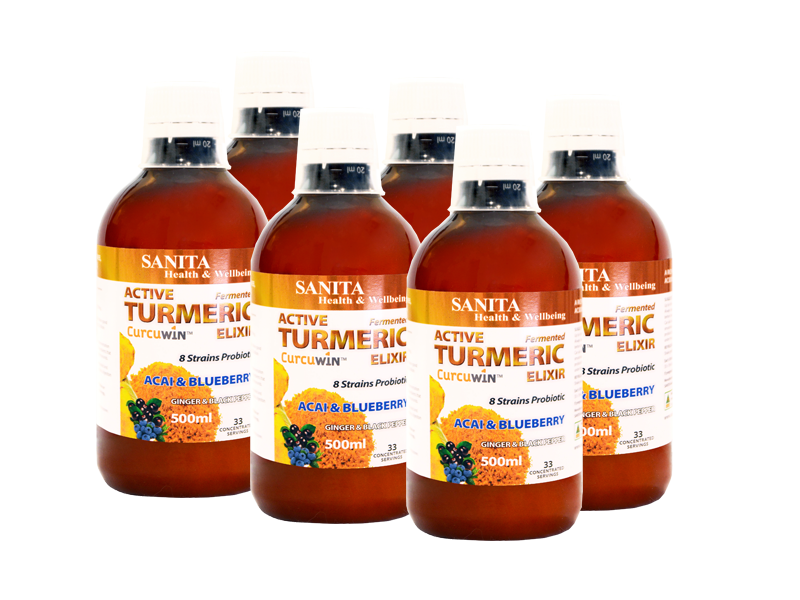 Through this process turmeric is activated and its key component curcumin is broken down into micronutrients for easy absorption and bioavailability making it easier for you to assimilate its medicinal properties. Turmeric, (botanical name: Curcuma Longa) is a plant in the same botanical family as ginger. The powdered turmeric you find in the spice aisle is made from the root of the plant by boiling, drying and finely grinding the roots of the turmeric plant. Although it grows in many tropical locations, the majority of turmeric is grown in India, where it is used as a main ingredient in curry. This vibrant yellowish / orange powder, often considered as the ‘Holy Powder’ in Ayurveda has been used for centuries by Ayurvedic and Chinese medical professionals as medicine for over 5,000 years. It is taken internally in the form of medicinally made juice, tinctures or specially made powder for the treatment of inflammatory disorders. It has an affinity for the blood and therefore able to circulate its powerful health benefits throughout the body. It is used to support a number of systems and functions in the body. Over the last few years, modern medicine has increasingly acknowledged the importance of turmeric as well, particularly the benefits of curcumin, a well-known and most studied phytonutrient in turmeric. Curcumin, is the active compound found in turmeric, a substance with over 100 pharmacological actions, including a powerful antioxidant and anti-inflammatory properties. Research has shown that Curcumin (turmeric extract) has a variety of proven medicinal benefits. It is one of the most widely researched natural substance with over 15,000 studies published to date. Chronic inflammation is known to be a contributor to many common diseases. Curcumin can inhibit many molecules known to play major roles in inflammation. Inflammation plays a vital role in fighting foreign invaders and repairing damage. If there is no inflammation, bacteria can overrun the body and eventually kill us. It’s when the inflammation becomes chronic (long-term) that issues begin and it’s believed that this can play a major contribution in every chronic disease. Alzheimer’s, cancer, heart disease, metabolic syndrome and various degenerative conditions can potentially be prevented and treated by addressing chronic inflammation. Curcumin is known to target multiple steps in the inflammatory pathway, at the molecular level. This blocks NF-kB, a molecule that travels into the nuclei of cells and turns on genes related to inflammation. NF-kB is believed to play a major role in many chronic diseases. Oxidative damage is believed to be one of the mechanisms behind aging and many diseases. It involves free radicals, highly reactive molecules with unpaired electrons. The main reason antioxidants are so beneficial, is that they protect our bodies from free radicals. Curcumin happens to be a potent antioxidant that can neutralize free radicals due to its chemical structure and curcumin also boosts the activity of the body's own antioxidant enzymes. This makes Curcumin unique as it not only neutralizes free radicals on its own but it also stimulates the body's own antioxidant enzymes. Antioxidants play a role in keeping our joints healthy. Your body uses antioxidants to combat free radicals. Free radicals are unstable particles that are created as a result of millions of chemical reactions in the body. They can cause oxidative stress and damage on a cellular level. When scientists examine the blood and joint fluid of patients that are suffering with joint discomfort, often times there is an increased activity of free radicals and lower levels of antioxidants. Curcumin being rich in antioxidants, can give you a healthy supply. The connection between inflammation and cognitive health cannot be overstated. Neurons are especially susceptible to inflammation and the release of inflammatory compounds in the body can be neurotoxic. Curcumin may help protect those precious brain cells. Curcumin boosts levels of the brain hormone BDNF (Brain-Derived Neutrotrophic Factor : a type of growth hormone that functions in the brain), which increases the growth of new neurons and fights various degenerative processes in the brain. By doing this, it may be effective at delaying or even reversing many brain diseases and age-related decreases in brain function. A healthy heart consists of many factors, especially eating healthy and routine exercise. Adding curcumin as part of your healthy diet may have many benefits to protect your heart. Oxidized LDL (Low-density lipoprotein) particles (that have been disrupted by free radicals) may produce inflammation in the cardiovascular system. Studies suggest that the antioxidant effects of curcumin can help fight those free radicals. Curcumin is also known to improve the function of the endothelium and is a potent anti-inflammatory agent and antioxidant. It is well known that endothelial dysfunction is a major driver of heart disease and involves an inability of the endothelium to regulate blood pressure, blood clotting and various other factors. Several studies suggest that curcumin leads to improvements in endothelial function. Alzheimer's disease is the most common neurodegenerative disease in the world and a leading cause of dementia. One key feature of Alzheimer's disease is a build up of protein tangles called Amyloid plaques. Studies show that curcumin can help clear these plaques. Curcumin can cross the blood-brain barrier and has been shown to lead to various improvements in the pathological process of Alzheimer’s disease. Arthritis is a common problem characterised by joint inflammation. There are several different types, but most involve some sort of inflammation in the joints. Given that curcumin is a potent anti-inflammatory, it makes sense that it could help with arthritis. Several studies show this to be true. Many studies have looked at the effects of curcumin on arthritis and noted improvements in various symptoms and in some cases more effective than anti-inflammatory drugs. Studies have shown that curcumin may work by reducing certain key inflammation-promoting enzymes in the body. In some studies curcumin performed well in promoting comfort and flexibility without the side-effects; providing a natural supplement alternative. Athletes and weekend warriors alike are also using it for muscle and joint health recovery, too. Your liver plays an important role in stabilizing and balancing the maintenance of your body. The health of your liver can be directly related to oxidative stress and pro-inflammatory substances. Curcumin may help boost antioxidant defenses to help the liver detoxify and restore balance. Your immune system is a network of various organs, tissues, and cells that work together to protect your body. Curcumin not only helps to enhance the responses of certain antibodies and cells within the immune system but may also help down regulate the expression of certain pro-inflammatory substances. Researchers have been studying curcumin as a beneficial herb in cancer treatment. It can affect cancer growth, development and spread at the molecular level. Cancer involves the uncontrollable growth of cells and while there are many different forms, they have some commonalities and they do appear to be affected by supplementing with Curcumin. In several studies, researchers have noted that Curcumin is beneficial in cancer treatment and in affecting the growth, development and spread at a molecular level. Studies have also shown that Curcumin can reduce angiogenesis (growth of new blood vessels and tumours), metastasis i.e the spread of cancer along with contributing to cancerous cell death. Disclaimer: This information is not intended to treat or diagnose any specific disease. As with any medical condition, one should consult their medical practitioner. Can also be added to your favourite smoothies and juices for an optimum probiotic drink. Each 15ml contains the goodness of 6 billion good bacteria (probiotics) measured by NKCA value comparing it to a 25 billion pure probiotic.